Recent arrival in Moscow, Fraser Young, delves into the myths and legends that help give his adoptive new home such a mysterious allure. Fraser Young is a recent graduate of Leeds University, where he studied History and Russian Language; he is an avid Russophile currently working full-time as an English teacher in Moscow, with a special interest in Russian history. I started studying Russian four years ago and have recently moved to Moscow to become one of those Brits abroad who, devoid of a plan, become a member of that most stable of professions, the English Teacher. Ever since I started my foray into all things Russian, I have been bombarded with very similar reactions from almost everyone I meet who is unfamiliar with the country. They ask these same four questions, in this very order 95% of the time, so I thought I’d try and answer them fully once for all in order to explain what it is about Russia that keeps me coming back. 1) Isn’t it always cold? In a word, no. Although it is certainly true that parts of Russia during the winter reach mind-bogglingly cold temperatures, this is not true for the whole year. During my year studying in Russia, the coldest temperature I experienced was -25 °C however, summer is an entirely different story with my highest temperature being around 30°C. I also believed this ridiculous stereotype…and ended up being the only person in Gorky Park mopping sweat from my brow wearing heavy full-length jeans that I was convinced would be appropriate. 2) But isn’t Russia scary? Moving anywhere abroad can be scary, you have to deal with a new language, new living conditions and generally acclimatising and that can be a bit daunting. But is Russia itself some sort of post-apocalyptic wasteland where something unpleasant is lurking around the corner? Not in the slightest. I can count the number of times I’ve been genuinely scared in Russia on one hand, and even they all turned out to be absolutely fine. For example we were once approached by a handful of neo-Nazis in a bar who thought we were German. Our fears were actually misplaced, they wanted to just chat with some real Germans and so with an apologetic and rather deflated salute they retreated to their table and left us alone. It was certainly unpleasant, but these people are no more common than the booze-soaked English Defence League-types you encounter in dingy pubs and bars across the UK. 3) But don’t they all hate Westerners? This final question is always rather harder to answer, even for the most committed Russophile. Frequently preceded by a pause and a look of worry that whoever is asking is about to cause great offence. The simple answer is: Why not? The long answer is far harder to put into words. I have always had a keen interest in Russian history, having read Stalingrad by Anthony Beevor at the age of eleven. This interest only grew with hours spent watching documentaries covering everything from Ivan the Terrible to Soviet involvement in Afghanistan. When deciding to study history with a foreign language at university, Russian seemed an obvious choice. But the choice goes far deeper than that. To a Brit hailing from leafy Surrey, Russia represents an entirely different world. The same in many ways, but so very different in so many others, to me Russia presents a unique opportunity and adventure, a chance to view the world from a different perspective. Put simply, an opportunity that was too good to pass up. 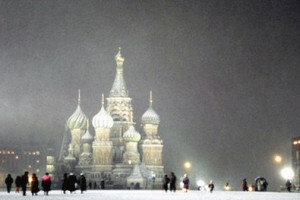 Russia is very different to home, but this is by no means negative, so why wouldn’t you come to Russia? You might hate it, but who knows, you might love it.